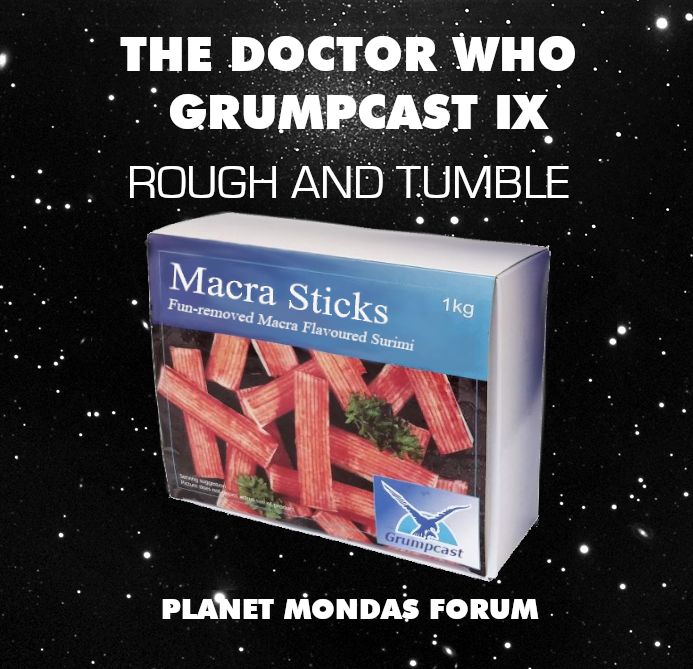 Doctor Who: The Doctor Who Grumpcast IX – Rough and Tumble. The Grumpcast is back for this jam-packed bumper edition! Tim, Simon and Richard have a butcher’s at sporting Who villains, an update on Phil Morris and missing episodes, a look at what PMF members were looking forward to in 2019, the latest on The Complete Collection Blu-rays and take an in-depth look at The Macra Terror animation. 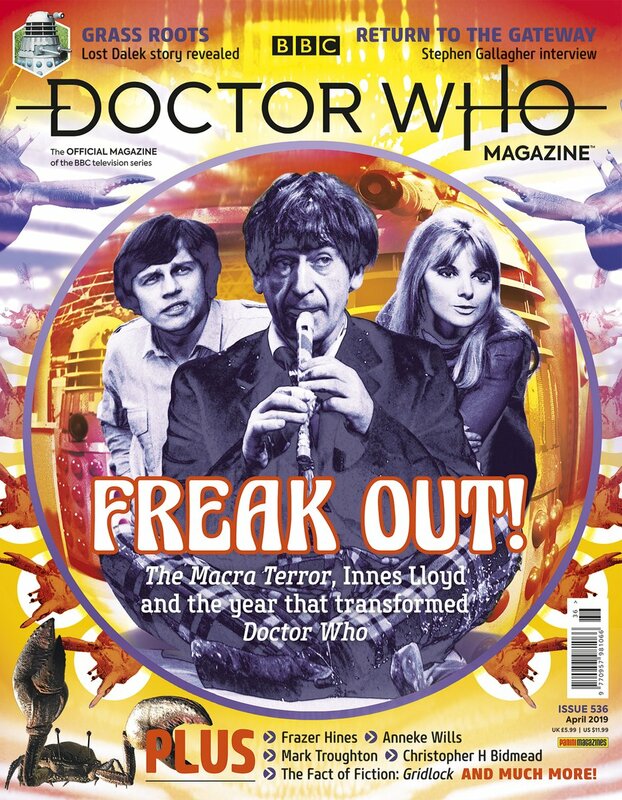 ANIMATED MACRA TERROR, ONLY IN DOCTOR WHO MAGAZINE 536! The Blogs of Doom, audio reviews, previews, news, prize-winning competitions and much, much more!! 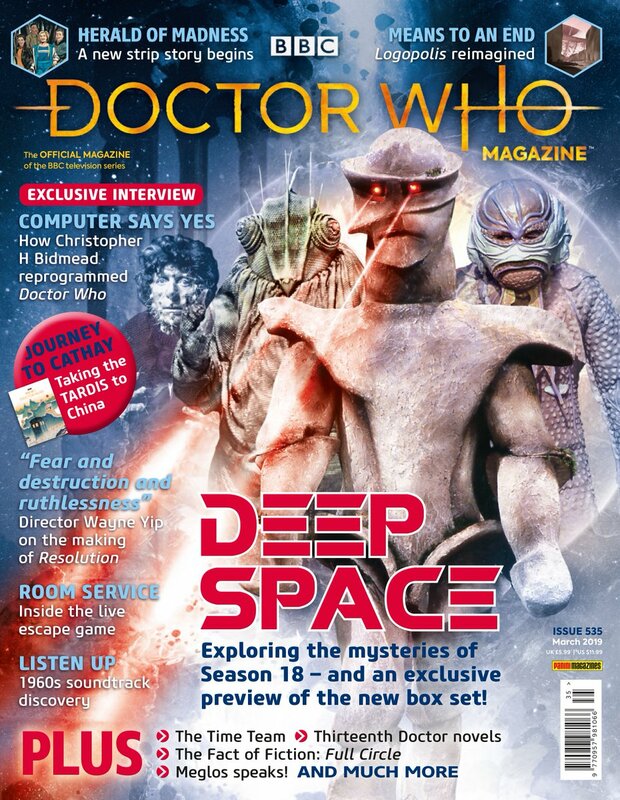 DWM 536 is on sale from 7 March, priced £5.99. Doctor Who’s creators envisaged a series that would go forwards, backwards and sideways in time. 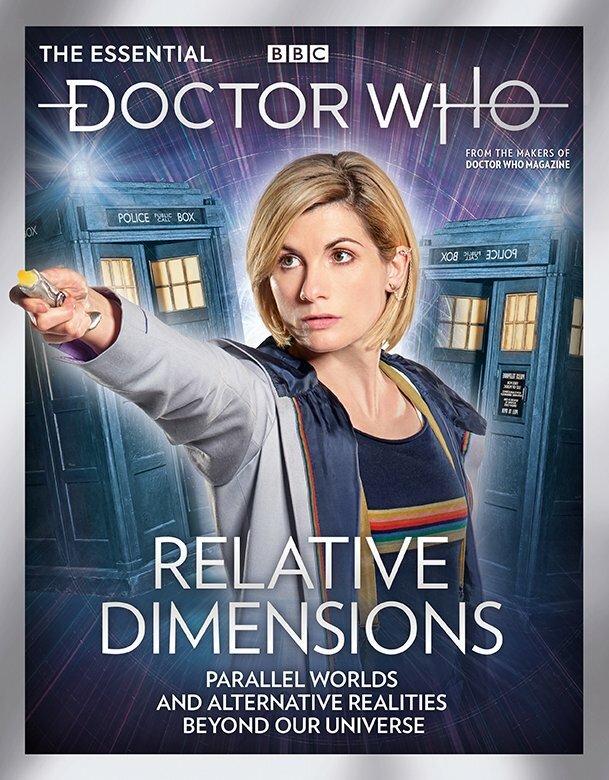 The Doctor’s trips to parallel universes and alternative dimensions have provided the show with some of its best-loved adventures – from its black-and-white beginnings to the latest episodes, starring Jodie Whittaker. Uncover the background to these memorable journeys and explore the greatest stories beyond the television series in this lavish publication, which is packed full of exclusive features and rare images. RESOLUTION’S DIRECTOR WAYNE YIP TELLS DWM HOW HE BROUGHT THE 2019 NEW YEAR’S DAY DALEK STORY TO LIFE! The Blogs of Doom, reviews, previews, news, prize-winning competitions and much, much more!! 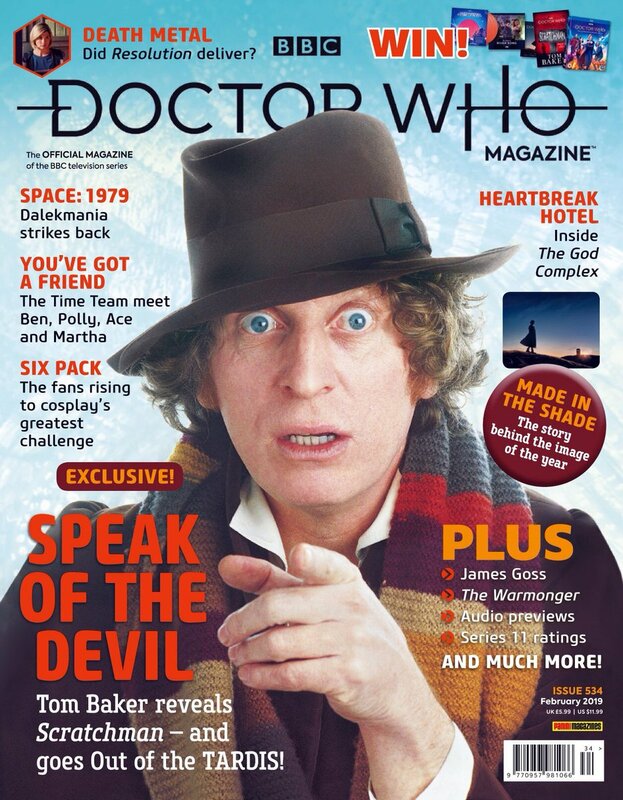 TOM BAKER SPEAKS TO DWM AHEAD OF THE PUBLICATION OF HIS FIRST DOCTOR WHO NOVEL! The Blogs of Doom, reviews, news, prize-winning competitions and much, much more! 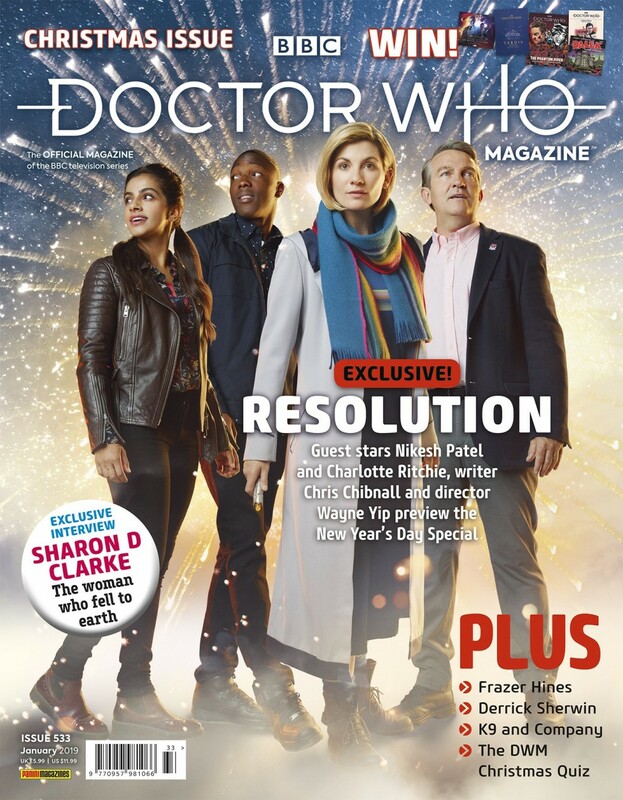 DWM 534 is on sale from 10 January, priced £5.99. 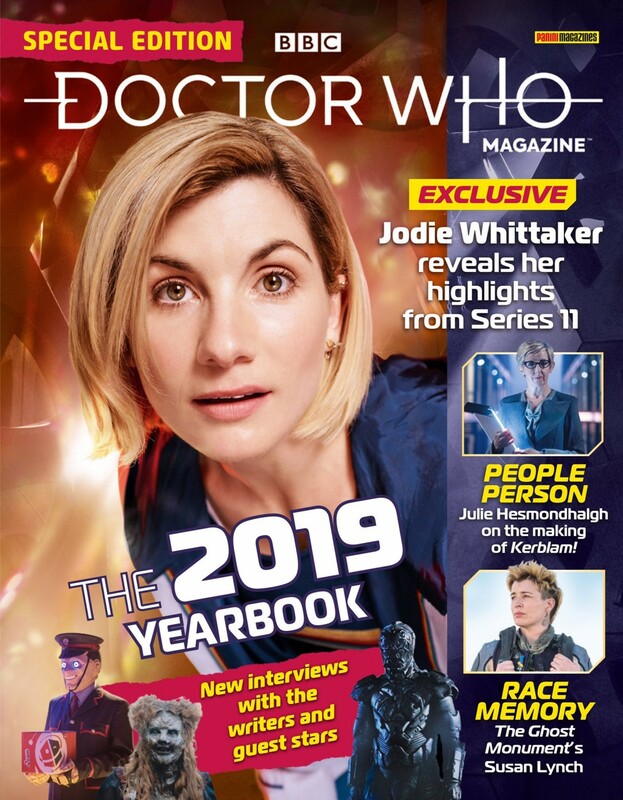 The Doctor Who Magazine Yearbook 2019 is on sale from 3 January at WH Smith and all good newsagents, price £5.99. EXCLUSIVE PREVIEW OF THE NEW YEAR’S DAY DOCTOR WHO SPECIAL IN THE LATEST ISSUE OF DOCTOR WHO MAGAZINE! The Special – Resolution – is written by Chris Chibnall. Chris says: “There’s no better way to start a new year than with Doctor Who. And knowing that it would play on New Year’s Day gave me the opportunity to write the New Year setting into the story. An in-depth look at Series 11’s ratings. An exclusive interview with Sharon, who played Grace O’Brien in the 2018 series. Frazer Hines answers questions from our TARDIS tin. DWM pays tribute to the Doctor Who script editor and producer who oversaw the series’ transition from black and white into colour. Highlights from a previously unpublished interview with Derrick Sherwin in 2014. Part Three of a brand-new comic strip adventure featuring the Thirteenth Doctor and her friends. The Time Team watches Doctor Who’s very first Christmas Day episode, 1965’s The Feast of Steven. Share your views on the latest series of Doctor Who. Delving into 1981’s spin-off series K9 and Company, starring Elisabeth Sladen as Sarah Jane Smith. Put your Doctor Who knowledge to the test with the DWM Christmas Quiz. Our verdict on Series 11 episodes Demons of the Punjab, Kerblam! and The Witchfinders. A FREE double-sided poster, The Blogs of Doom, reviews, news, prize-winning competitions and much, much more! Doctor Who Magazine 533 is on sale 13 December, priced £5.99. 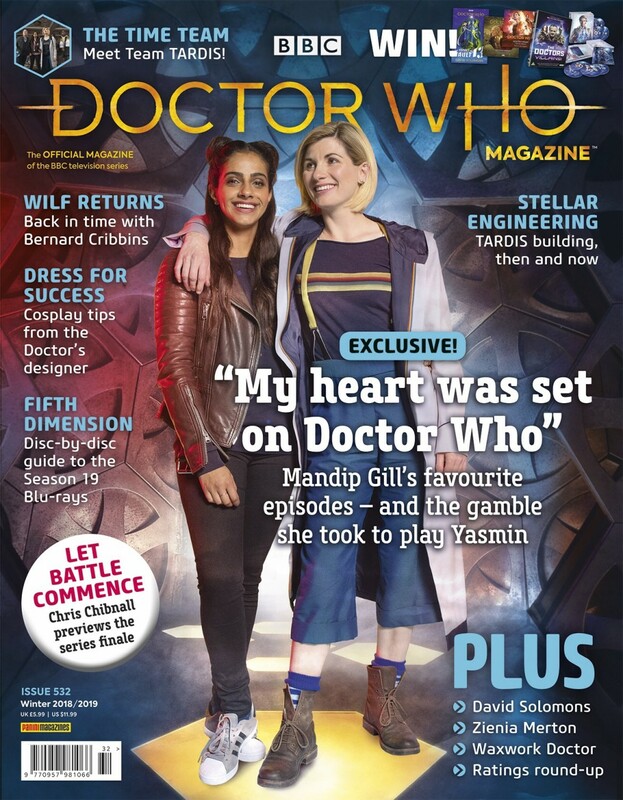 EXCLUSIVE INTERVIEW WITH MANDIP GILL IN THE LATEST ISSUE OF DOCTOR WHO MAGAZINE! Looking ahead to the final four episodes, beginning with Kerblam!. DWM attends the unveiling of the waxwork Jodie Whittaker at Madame Tussauds in Blackpool. The second part in a series of features looking at the evolution of the TARDIS. Doctor Who’s costume designer Ray Holman provides tips on how to cosplay members of Team TARDIS. Bernard Cribbins answers questions from our TARDIS tin. Key members of Doctor Who’s current production team describe their roles. Part Two of a brand-new comic strip adventure featuring the Thirteenth Doctor and her friends. The Time Team watches the Thirteenth Doctor’s first episodes. An interview with the author of the recently published Doctor Who novel The Secret in Vault 13. Our verdict on Series 11 episodes Rosa, Arachnids in the UK and The Tsuranga Conundrum. A look at Doctor Who: The Collection – Season 19. 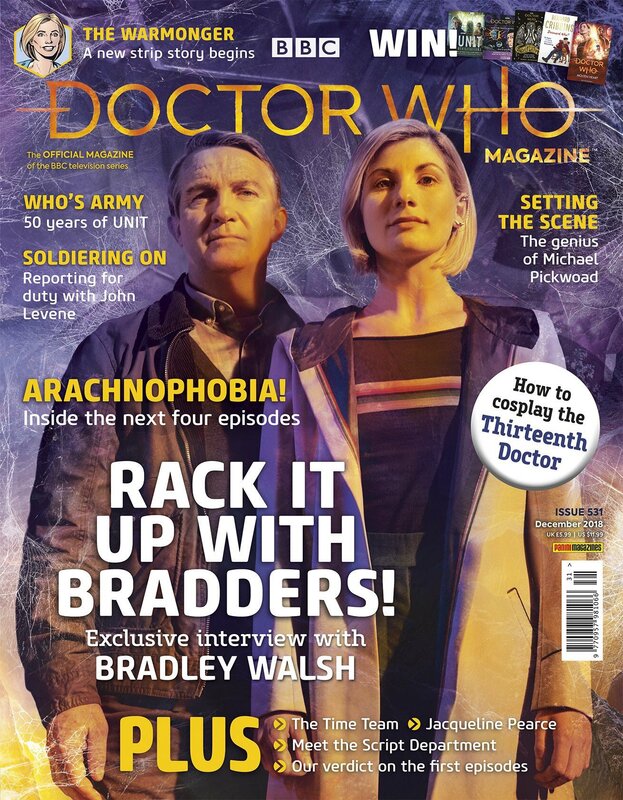 BRADLEY WALSH EXCLUSIVE IN THE LATEST ISSUE OF DOCTOR WHO MAGAZINE! Exclusive previews of the next four episodes: Rosa, Arachnids in the UK, The Tsuranga Conundrum and Demons of the Punjab. A tribute to the production designer who worked on Doctor Who from 2010 to 2017. Exploring the origins of UNIT, which made its debut in Doctor Who 50 years ago. DWM investigates the role UNIT plays in Doctor Who. We join UNIT’s Sergeant Benton on a very special day out. Members of Series 11’s Script and Story Department describe their roles. The Thirteenth Doctor makes her DWM comic strip debut. A tribute to the actress who played Chessene in 1985’s The Two Doctors and more recently Cardinal Ollistra in Big Finish’s War Doctor audio adventures. The Team listens to some Who-related chart hits. Tips from Thirteenth Doctor cosplayers. Our verdict on the first two episodes of Series 11: The Woman Who Fell to Earth and The Ghost Monument. Doctor Who Magazine 531 is on sale 18 October, priced £5.99. Doctor Who: 13Cast Episode 6 – Battle-scarred. The Gremlins have got a tight grip on 13cast this week. Giles’ PC didn’t record the first half, Paul’s PC decided to reboot at random intervals and Simon’s microphone was a bit variable, so Richard may have sacked the lot of them. But despite this, we’ve got our review ready for The Battle of Ranskoor Av Kolos and our thoughts on the season as a whole. Doctor Who: 13Cast Episode 5 – On Reflection. It’s Advent and the 13cast crew ponders the move of Doctor Who from Christmas to New Year. Then it’s review time for The Witchfinders and It Takes You Away, before a debate on the nature of Doctor Who and whether the last episode is an allegory for the latest series. Finally our Christmas lists. Note: Simon’s audio was badly affected by interference. We’ve done our best to edit round this, but there is distortion on his contributions and some have been lost. Doctor Who: 13Cast Episode 4 – Bubble Trouble. 13cast wonders – just why is there a 10 minute colour animation of Wheel in Space for Missing Believed Wiped at 25? Then the crew returns to the task of reviewing Demons of the Punjab and Kerblam! with diversions into Puncast and Latincast. And the famous sweet Yorkshire staple of Rhubarb. Which may, or may not be connected to Kerblam! via Doctor Who: 13Cast Episode 3 – Anamorphic in the UK. After the 13cast crew perform their tribute / insult to the 4 Yorkshiremen, it’s time to deliver their reviews of Arachnids in the UK and The Tsuranga Conundrum, with a brief diversion into BakeOffcast. And after a couple of positive episodes, there’s a bit more grumpiness this time. via Doctor Who: 13Cast Episode 2 – Sit Down. After Richard finds out he’s on a different wavelength from the rest of the 13cast crew, he’s also a bit hazy on the nature of Rosa Parks’ protest. The team then give their reviews of The Ghost Monument and Rosa, including chapter 3 of anamorphic lenses. Keep listening to the end for the first installments of Masterchefcast and SkyAtNightcast. We also break it to Simon that Jane Horrocks is from Lancashire. AN EXCLUSIVE INTERVIEW WITH JODIE WHITTAKER, PLUS PREVIEWS OF HER FIRST TWO EPISODES – ONLY IN DOCTOR WHO MAGAZINE! The latest update from Doctor Who’s showrunner. Meet the team responsible for bringing the new series to our screens. He’s best known for his sitcom appearances, but Matt Berry is reinterpreting the Doctor Who theme for his new record. Secrets of the TARDIS control room revealed! A meticulous recreation of the torn coat worn by the Twelfth and Thirteenth Doctors in Twice Upon a Time and The Woman Who Fell to Earth. An interview with Christian Erickson, whose new concept album is inspired by The Caves of Androzani. The Twelfth Doctor’s final DWM strip adventure comes to a shattering conclusion. The Time Team watches four very different episodes in an effort to discover what the First Doctor was really like. In-depth analysis of the 2006 Tenth Doctor story School Reunion. The Blogs of Doom, reviews, news, a huge prize-winning competition and much, much more! 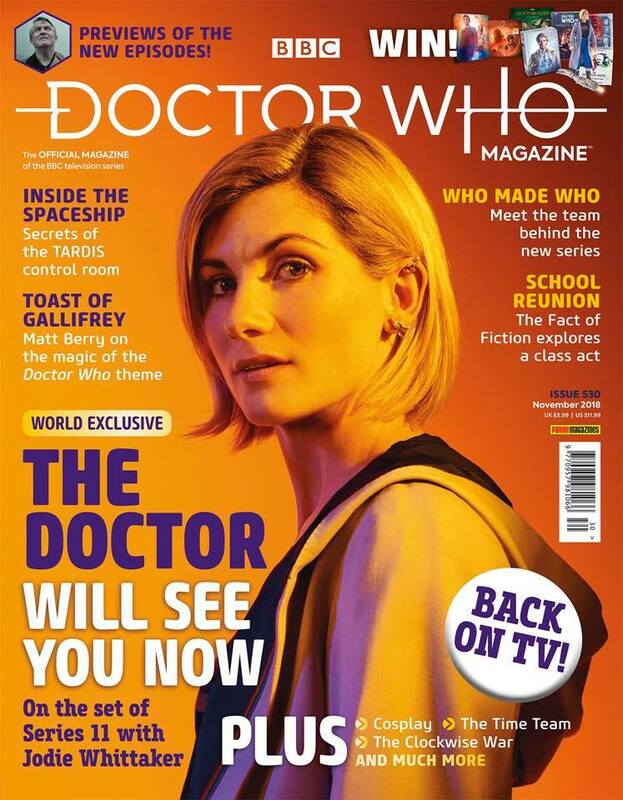 Doctor Who Magazine 530 is on sale 20 September. Regular edition £5.99, deluxe edition £9.99. After watching Doctor Who for over 45 years, Richard finally has a Doctor that sounds like him. Well, a little bit. Since none of them could get a ticket to the all-star Sheffield premiere, he’s invited the 13cast crew round to discuss the debut of the Yorkshire Doctor in a story set in Yorkshire with someone who was born and brought up in Yorkshire. Yorkshire. Mere days after Grumpcast VII is published, an unscheduled mild-emergency Grumpcast sees Eric, Mike and Richard nibble on the missing episodes carrots dangled by Messrs. Morris (not Paul) and Vanezis on Friday 5th October. What does Phil Morris’ appearance on The One Show signify, if anything? Who knows – but here’s our attempt at a “hot take”, as the kids say. Turn off the TV’s – pour a glass of wine and enjoy, then go back to Grumpcast I and start again. Why not? There’s nothing else on tonight! Eric and a new Grumpcaster chew over the mysterious wonderbox that is Season 3. Missing episodes, slaughter, high comedy, slaughter, a musical, more companions than you can shake a Chumbley at, slaughter and of course gratuitous lightweight vase throwing all feature. Not to mention the epic Daleks’ Master Plan. Is the low position in the last DWM poll for this Season justified? Like buggery it is! Bored of waiting for Series 11? While away a couple of hours with the Grumpcast. This episode may contain Fraggles. After losing his grip at the helm of the Grumpcast, Richard falls to Earth and recruits some new friends. Together they chew over the latest trailer for Series 11 and take a fair few tangents. If Paul sounds like he’s locked in a cupboard in the Dalek city on Skaro, thanks to the magic of Skype, he may very well be. 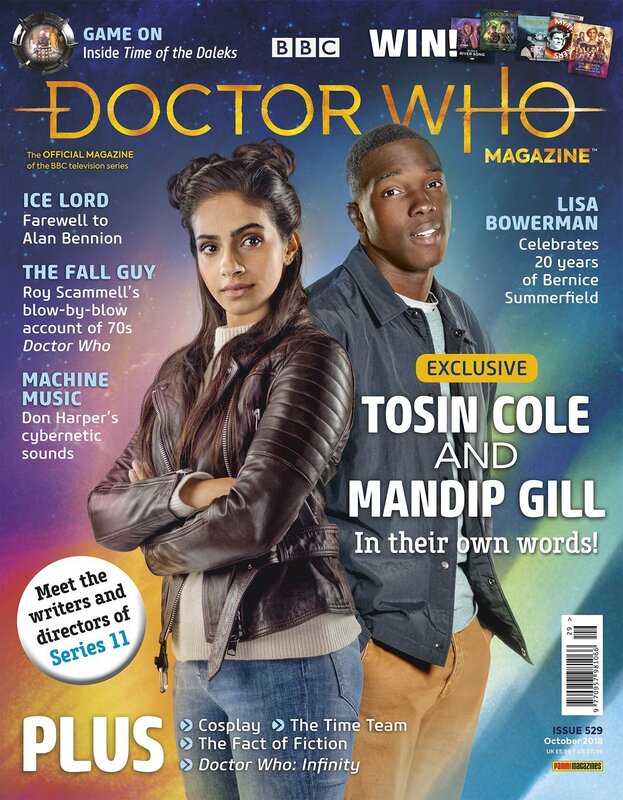 SERIES 11 COMPANIONS MANDIP GILL AND TOSIN COLE WRITE FOR DOCTOR WHO MAGAZINE! READ THEIR DOCTOR WHO DIARY IN THE LATEST ISSUE. Previews, audio, DVD and game reviews, news, The Blogs of Doom, prize-winning competitions and much, much more! PLUS a huge double-sided poster featuring the Doctor, Yasmin, Ryan and Graham. DWM 529 is on sale from 23 August, priced £5.99.